Medicinal substances have been used in China for millennia, and Chinese Herbology is a complete system of diagnosis and prescription that is powerful in its ability to address complex health issues. When I prescribe herbs for my patients, I often get asked many questions about the composition of the formulas as well as about how they work. In this Introduction to Chinese Herbal Medicine, I’ll be introducing some of the basic concepts used in Chinese Herbology to help demystify the complex process of herbal prescribing. Chinese Herbology has its roots in four primary historical texts that all date back to about the third century. The texts are the Yellow Emperor’s Classic (Nei Jing) that outlines the basic theoretical principles of Chinese medicine, the Divine Husbandman’s Materia Medica (Shen Nong Ben Cao) that is credited with being the first compendium of Chinese herbal knowledge, the Discussion of Cold-Induced Disorders (Shang Han Lun) and the Essentials from the Golden Chamber (Jin Gui Yao Lue) both of which go into great detail about diagnostic pattern differentiation and prescribing of Chinese medicinals. One of the most basic things to keep in mind about Chinese herbal formulas is that they are not merely a mixture of random herbs that is haphazardly put together. Each formula is a carefully crafted blend of herbs that work synergistically to balance and enhance each other to bring about the best therapeutic results. This balance can take many forms such as one herb strengthening the effect of another, one herb counterbalancing an undesirable property in another herb such as toxicity, or one herb working to harmonize all the herbs in the formula to make it easier to process and digest. Additionally, specific therapeutic strategies and methods underlie the formulation and application of herbal combinations. The herbs in formula combinations are divided into four categories: chief, deputy, assistant, and envoy. The chief herb is the main herb(s) in the formula that is directed toward the principal pattern of disharmony. The chief is an indispensable ingredient and has the greatest effect upon treating the pattern. The deputy herb(s) aids the chief herb in treating the principal pattern of disharmony and also serves as the main ingredient to treat any coexisting patterns. The assistant herb(s) reinforces the effect of both the chief and deputy herbs, and also directly influences a less important aspect of the main pattern. The assistant herbs also moderate or eliminate the harsh nature of other ingredients and reduce the toxicity or side effects of other herbs in the formula. The envoy herb(s) focuses the action of the formula on a certain channel or area of the body. The envoy also harmonizes and integrates the actions of the other ingredients in the formula. The formula for allergies, Jade Windscreen (Yu Ping Feng San), that I mentioned in my last blog post is a good example. The chief herb in this formula is Astragalus. This herb is directed against the primary pattern of disharmony, which, in the case of allergies, is an imbalanced immune response. Atractylodis, the deputy, reinforces the action of the chief herb by helping to normalize immune response, and also goes a little further by strengthening the lung and spleen energy, thereby addressing the root cause of the immune imbalance. Ledebouriellae, the assistant herb, helps both the chief and deputy herbs stabilize the immune system while also protecting the body from invasion by wind. (See my last blog post for more information about wind and allergies.) This formula does not include an envoy, illustrating the fact that not every formula has every component. Likewise, many formulas have multiple deputy and assistant herbs. 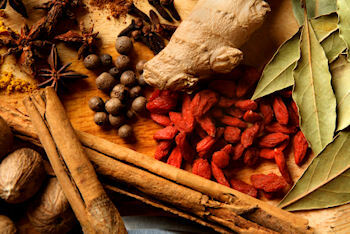 It is this multi-layered treatment approach that allows Chinese herbal formulas to be so effective. Each formula is designed carefully to not only address symptoms, but to also go deeper to address the cause of the symptoms. The formulas, therefore, not only provide symptom relief, but they also help to correct the body’s imbalances to prevent the symptoms from recurring. The complexity behind each formula is why it is always best to consult with a formally trained Chinese herbalist to make sure that you take the most appropriate formula for your specific condition. Traditionally, herbal formulas were decocted by boiling raw herbs and drinking the resulting liquid. This form is known as a tea. Because raw herbs require a good bit of time and effort to cook, granules are an easier way for a practitioner to have the same ability to modify a formula for a specific patient without requiring the patient to cook herbs. Granules are decocted herbs that are then dried into a powder form. The powder is then reconstituted with boiling water and taken as a tea. Many classic formulas are also available in tablet or tincture form, and these are also wonderful choices. Herbal formulas work best when patients take them, so it is always best to give patients a choice about how to take their herbs to see which form will fit best into their lifestyle.